Over the past 300 years, there have been more than 200 reports of persons burning to a crisp for no apparent reason. The two most common explanations offered to account for apparent SHC are the non-spontaneous "wick effect" fire, and the rare discharge called static flash fires. 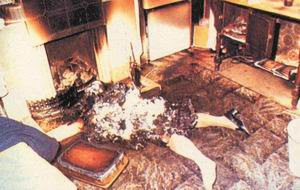 - Alcoholism - many Spontaneous Human Combustion victims have been alcoholics. But experiments in the 19th century demonstrated that flesh impregnated with alcohol will not burn with the intense heat associated with Spontaneous Human Combustion. - Deposits of flammable body fat - Many victims have been overweight - yet others have been skinny. - Divine Intervention - Centuries ago people felt that the explosion was a sign from God of divine punishment. - Build-up of static electricity - no known form of electrostatic discharge could cause a human to burst into flames. - An explosive combination of chemicals can be formed in the digestive system - due to poor diet. - Electrical fields that exist within the human body might be capable of 'short circuiting' somehow, that some sort of atomic chain reaction could generate tremendous internal heat. NO satisfactory explanation of Spontaneous Human Combustion has ever been given. It was an unsolved mystery up until now. THE TRUTH ABOUT HUMAN SPONTANEOUS COMBUSTION SHC. Interlocutor: What is behind the spontaneous human combustion SHC? There are many cases in which people suddenly catch fire internally to such a point that their bodies literally become ashes. The strange thing is that no object around, even at few centimeters from the victim is even scorched. On the other hand, to generate that combustion, it would be necessary a temperature of combustion of 2500º C and that would be impossible to achieve in the physical plane with normal means. Johnakan Ur-El: In the spontaneous human combustion there is nothing strange or magical. There are two types of combustion. One of them is made on purpose to cover up a murder or a plot against one person. Interlocutor: Are we speaking that when one wants to kill a person the murderer simulate a spontaneous combustion as a facade to hide the crime? Johnakan Ur-El: Well, what really happens is that sometimes there are so many attacks against a certain individual, because that incarnated being has his Thetan  in the vibrational plane 2 or 3. Johnakan Ur-El: Then his Thetan is permanently disputing against other rebellious spirits. When this Thetan has so many fights, so many combats against other spirits of those planes of error, These spirits instead of attacking the Thetan, they attack directly to his physical part. Interlocutor: How many spirits attack in this way? Johnakan Ur-El: Thousands of spirits... They attack with so much strength, with so much ferocity, with so much negativity that "making focus" they can develop an enormous heat. Interlocutor: Is it Something similar like when we use a magnifying glass, we can concentrate the sunbeams and provoke combustion? Johnakan Ur-El: Something similar... In the same way that a spirit "making focus" can move a small object, thousands of spirits "making focus" can end up producing that type of combustion in a person. Interlocutor: I understand... Then Isn’t there a third possibility? Johnakan Ur-El: No, there are two, nothing more. Interlocutor: I still have the doubt of why the spirits of Error, being able to make big damages “making focus”, they don't do it. Radael: For a simple reason, and it’s covering the embodied beings because the spirits cannot reach consensus with other spirits to gather and “make focus” in order to damage an incarnated being. Interlocutor: I don't understand well. Radael: I explain it. The spirits who are in the Eighth Sphere suffer so much due to their own pains as well as those pains that others suffer in themselves, and this circumstance makes that their minds don't have the necessary lucidity to concoct things and damage to incarnated beings. Interlocutor: what you want to tell me is that their own pain prevents them to think, in the same way as it happens to us in the physical plane when, for example, we have a terrible headache? Interlocutor: And the spirits of Error? Radael: The spirits of Error could gather all at the time and make focus in order to produce spontaneous human combustion (SHC) in thousands of incarnated beings, but we have an ally in our favor and I express it in this way because in this, I am with you. This is the great selfishness that they have. Radael: For example, A spirit of the plane of Error 2, has hatred against a human being who has outlived him because when he was incarnated this being made his life impossible. Then this spirit has a deep bitterness, holding grudges and he looks for help from other spirits of error in order to make focus and provoke a spontaneous combustion on that incarnated being so that he dies too. Well, he doesn't get it! Because they answer him, for example: "Oh, leave me alone, I am in other things! ", and then they don’t help him. Interlocutor: And that selfishness is convenient to incarnated beings of the physical plane obviously. Interlocutor: Now, I understood perfectly. The term Thetan was coined by Ron Hubbard to refer the incarnated person's spirit. In the physical plane only 10% of our Thetan animates our body and our mind. The other 90% is in the corresponding spiritual plane. When we disincarnate we continue existing as spirits. This entry was posted at Tuesday, May 19, 2009 and is filed under Mysteries and Enigmas . You can follow any responses to this entry through the .